A perfect job description is absolutely mandatory to hire the best candidates for the position advertised. A perfect and complete job description will help the candidates evaluate themselves and then apply for the job if they find themselves having all the necessary qualities. It makes the process of evaluation transparent and swift. 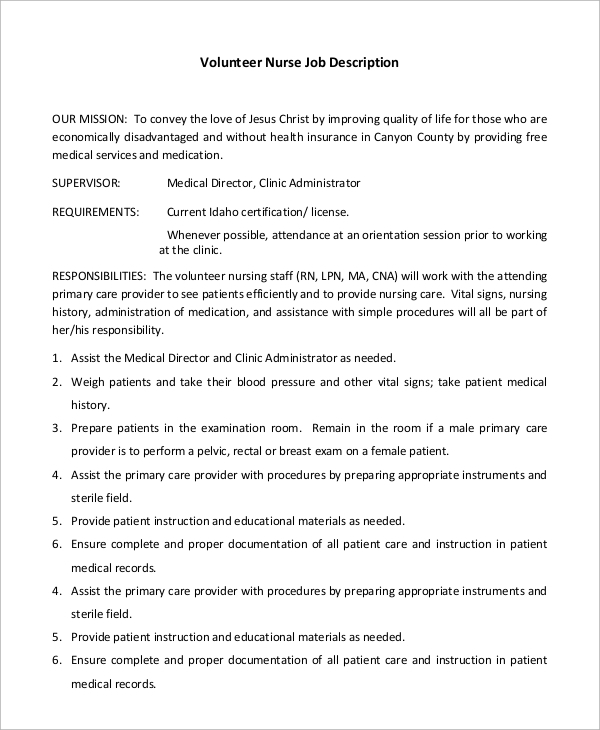 The following nurse Job Description Samples have the perfect layout, sample texts, and all the essential provisions so that no point is left behind. 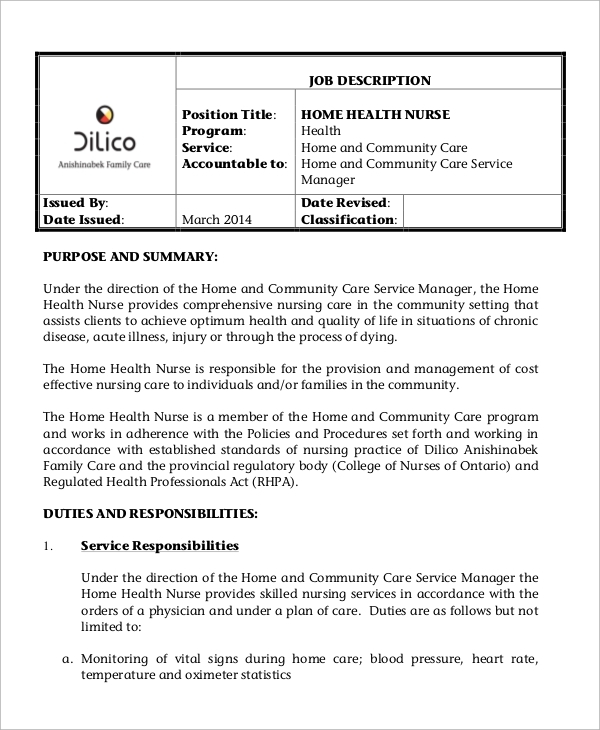 This is a Job Description for a home health nurse. It contains provisions and details about the job and its purpose, the duties and responsibilities one needs to perform, qualifications one needs to possess and it also mentions certain conditions of the employment. This is a complete job description of certified nursing assistant. It describes the job responsibilities, requirements for the post, duties one needs to perform regularly and the qualification, and certification and experienced required. 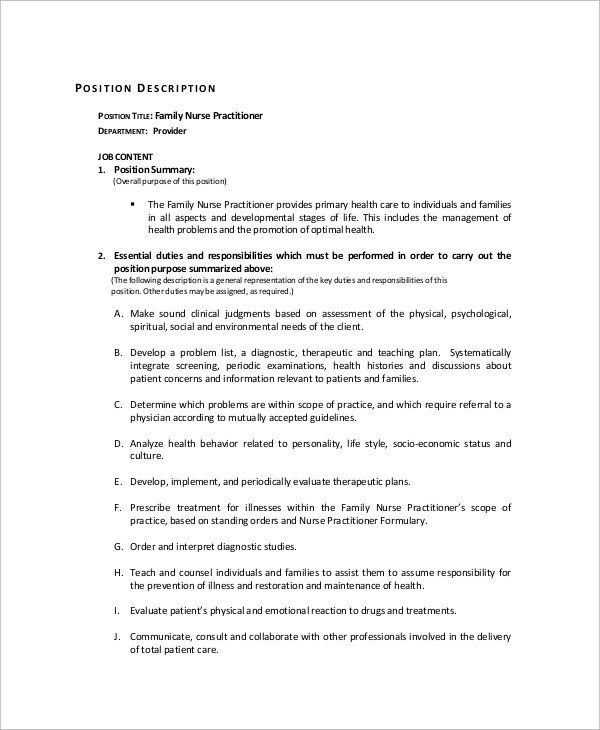 This job description for family nurse practitioner contains the position summary, essential duties and responsibilities, qualifications, process of evaluation, additional duties, and work experience or training. 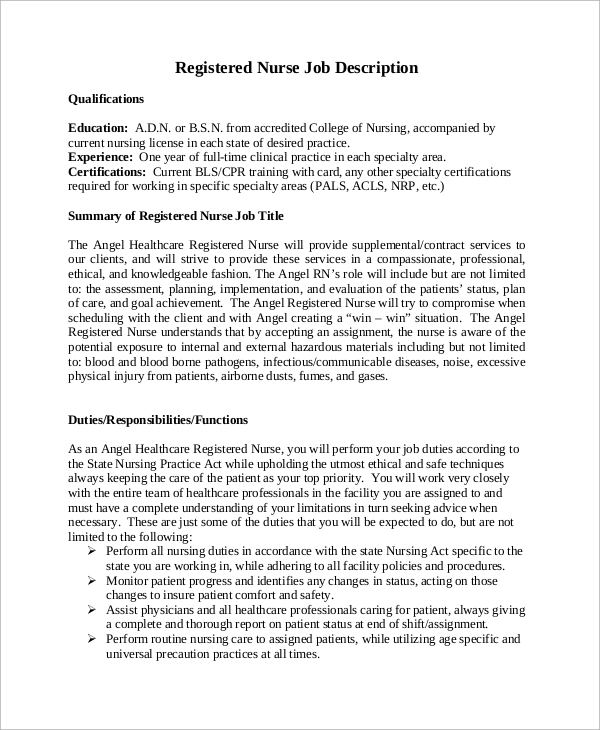 The above-listed generic, certified, and Registered Nurse Job Descriptions have complete sample texts and all essential provisions so that the nurse recruiting agencies have no problem forming their job description for different types of nurses without missing out any vital points. Such complete job descriptions will help the freshers and experienced nurse to prepare nurse resumes according to the requirements where they highlight only the relevant skills and traits. Different types of job descriptions for different types of nurses are provided for better preparation. This job description for registered nurse hiring contains the qualification requirements, summary of the job title, duties and responsibilities one needs to perform, and other necessary provisions. 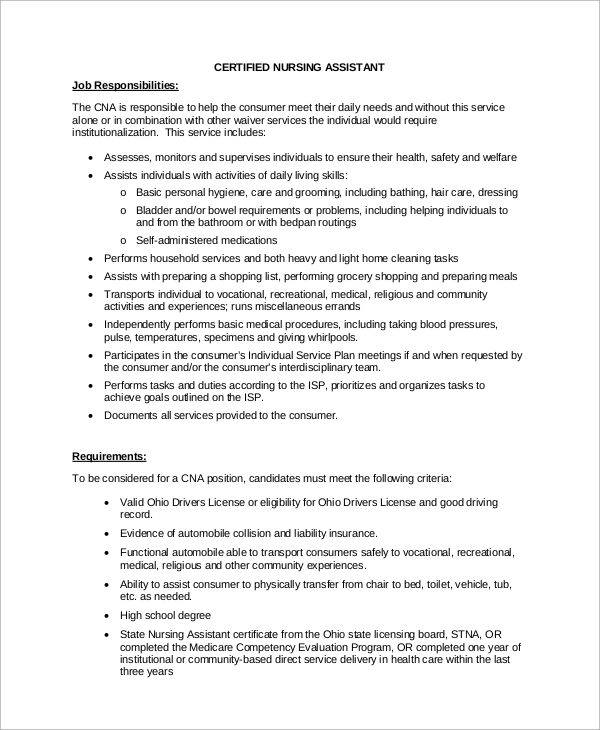 It contains multiple job descriptions such as for certified nursing assistant, licensed nurse, etc. 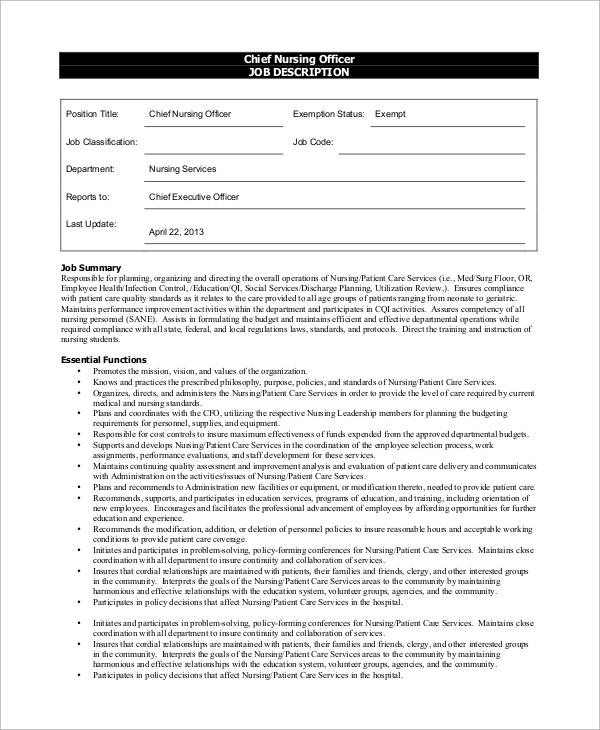 You may also check RN Job Description Templates. 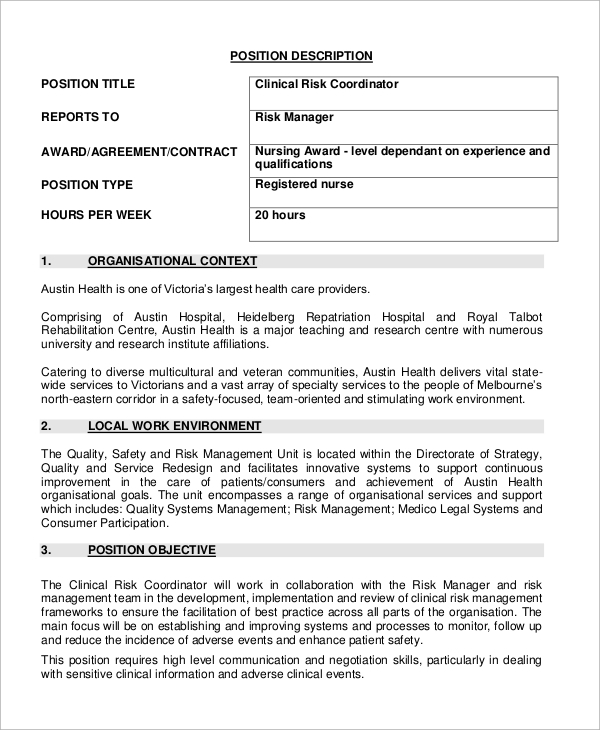 This is a perfect job description for a risk coordinator nurse. It gives a summary of the organization, local work environment, position objectives, position requirements in terms of generic skills, education and training, and other relevant information. 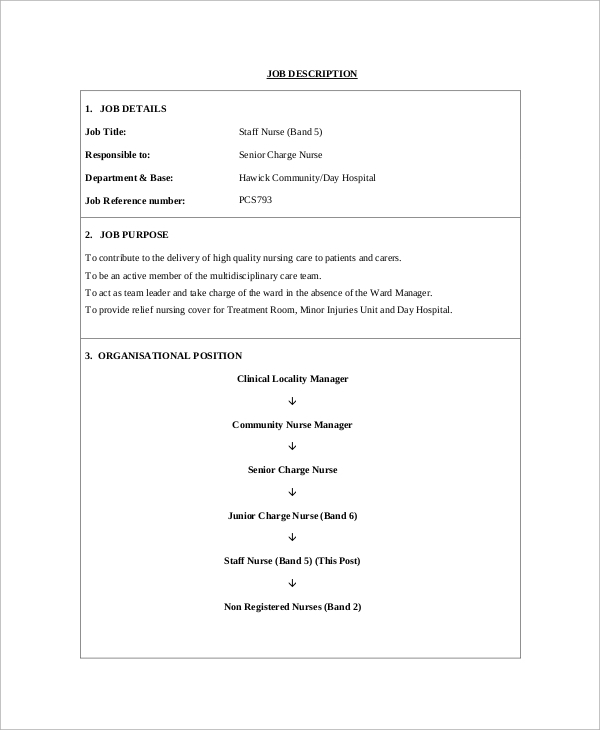 The targeted audience for the nurse job descriptions are the recruiting agencies who have contracts with different hospitals and nursing homes to appoint appropriate candidates according to the requirements. These are also applicable for the nurse providing organizations who provide home health nurse, family nurse practitioners, and even certified and registered nurses to residents, local hospitals, and big nursing homes. Even hospitals and nursing homes can use them directly in the requirement is not big enough to give the contract to recruiting agencies. 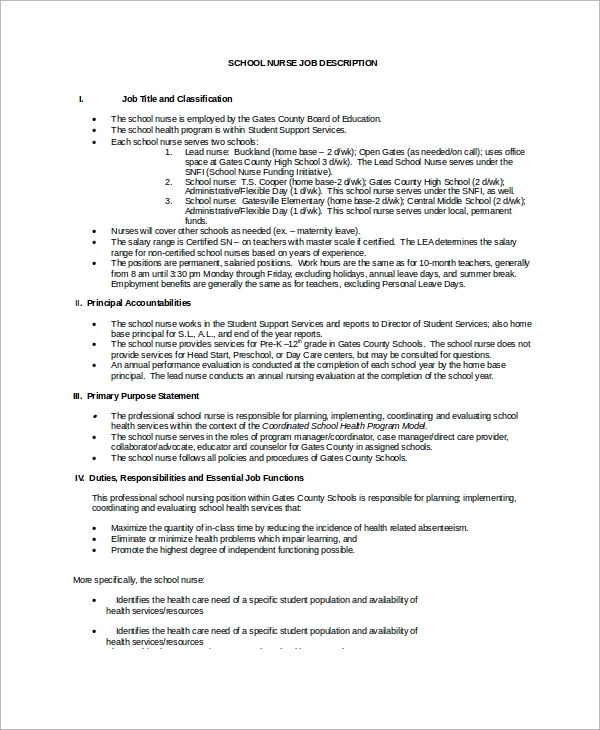 You can also see CNA Job Description Samples. 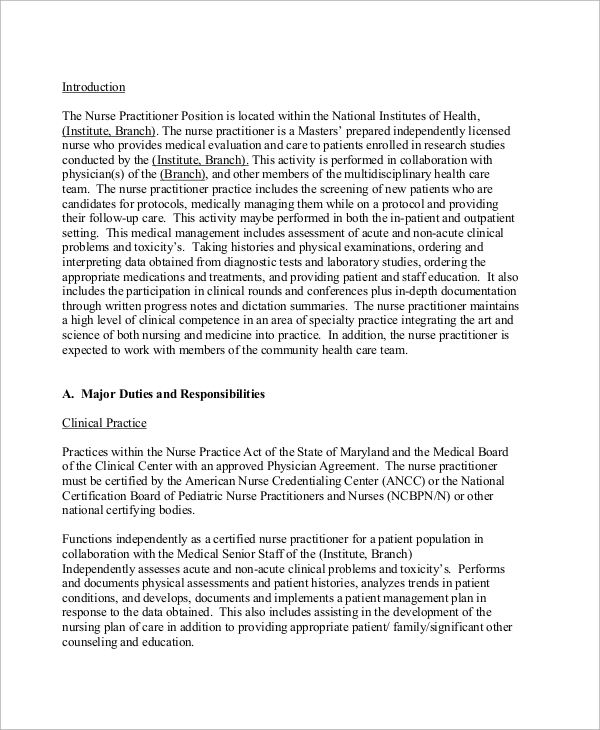 The above-listed nurse Sample Job Descriptions have multiple variants such as job descriptions for risk coordinator nurse, registered nurse, home health nurse, certified nurse assistant, and family nurse practitioners. Different nursing jobs have different requirements and these job descriptions will help the nurses to prepare for the job interviews.